Higher education has a diversity problem. While colleges and universities have hired more African American, Hispanic and Asian American faculty members than in the past, percentages of historically underrepresented groups among full-time faculty have not changed much over the last 20 years, even as diversifying the academy has become a top goal across higher education. Many of the graduate programs that are educating the future professoriate are not much more diverse than the faculties are. And while colleges have made big strides in the diversity of undergraduate student bodies, the professoriate has lagged. Good intentions and well-meaning discussions about diversity are not enough. What is needed, according to more than two dozen experts across higher education who work on issues of diversity, are systematic and cultural changes that in turn can create shifts in how institutions recruit, hire and promote faculty members, as well as how they admit graduate students. Amid broad demographic change in our country, and at a time when racial, gender and social inequities are front and center, colleges increasingly cannot afford to ignore diversity. This in-depth report includes insight from experts on the cutting edge of diversity work. It offers ideas and models for institutions that are looking at faculty representation and know they need to do more. How the lack of diversity in doctoral programs creates blockages in the diversity faculty pipeline. How to create a comprehensive graduate school admissions process that encourages a more holistic review of prospective students. The role that bridge programs and HBCUs play in increasing diversity in graduate school programs. The importance of putting diversity and inclusivity into strategic plans and messages from university leaders. 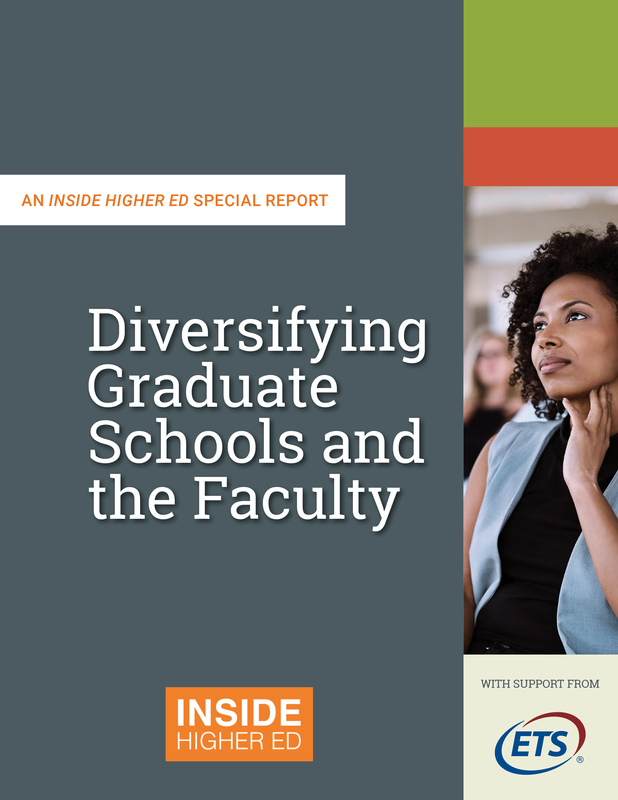 Best practices for recruiting and hiring diverse faculty and case studies of institutions who have created successful programs and initiatives. Infographic: How Diverse Are the Professoriate and Graduate Schools? This report was made possible in part by the financial support of Educational Testing Service (ETS). About the Author: Kathryn Masterson is a journalist who writes about higher education, including new models of learning, ways to raise more money and profiles of faculty members doing interesting things. She has written for Inside Higher Ed and The Chronicle of Higher Education on topics including faculty retention, undergraduate research, trustee orientation and alumni engagement. She has also written for Prism (the magazine of the American Society of Engineering Education) and numerous university magazines. From 2008 to 2011, Masterson was a staff reporter at The Chronicle, where she covered fundraising and college leadership. Prior to The Chronicle, Masterson was a news reporter with the Chicago Tribune’s RedEye edition, the Associated Press, and the Philadelphia Inquirer. She has also written for the Washington City Paper. She lives in Chicago. Group Orders: For information on purchasing multiple copies at a bulk discount, please email [email protected] . Support: Please email [email protected]  with questions regarding the report or your order.